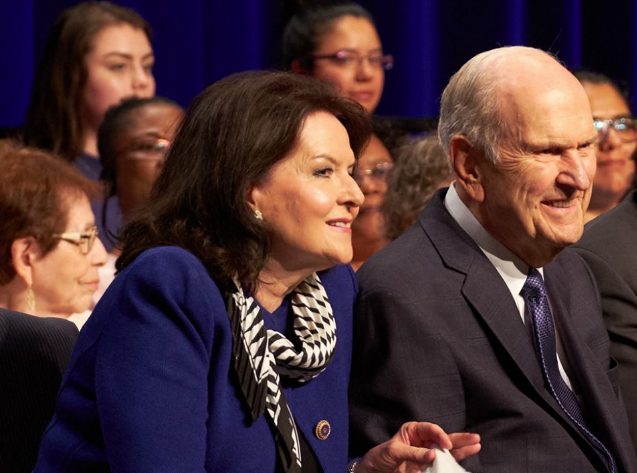 After returning to Salt Lake City late last night, Kathy and I have continued to think about and talk about the experiences of the past few days with deep appreciation for the unparalleled experience of being with President and Sister Nelson. Listening to Sister Wendy Nelson bear testimony of President Nelson’s prophetic calling and having her give a glimpse into what it has been like in their home since he became the Lord’s prophet, strengthened the faith of those who listened. Sister Nelson spoke of her own witness of President Nelson’s prophetic calling. She said, “Two days after President Monson departed the Lord gave me a singular, most distinct experience with my husband. So distinct, so vivid, so clear. Every detail of that experience is seared in my mind and heart forever. Two days later it happened again exact same experience again” (to her alone). I, too, would add that it was amazing to me that a man fewer than three weeks away from being 94 years old could go to the pulpit last night in Toronto with no notes, never repeating himself and speaking for 45 minutes, with the audience of 8,000 riveted on him and his message. When I commented on this after the meeting, President Nelson said, “Well, these people have come from a long way. They come prayerfully. The last thing they want me to do is come to the pulpit and read them a talk.” It was an experience of revelation. "We thank Thee, Oh God, for a Prophet". The preparation for President Nelson to become the prophet is amazing. Read the book of his life, and you too will be converted to the whole process a mortal man goes through in order to be a pure conduit for the words of God. How I love and admire this great man!! And how very grateful I am that our Heavenly Father is watching over His church in these confusing and trying times! I am grateful beyond words to be a part of the kingdom of God!